Free from Anxiety: Saints and Scripture Sunday - The Kennedy Adventures! Each week at Mass, as we hear a version of these words during the Prayer of Peace, I feel a huge sigh escape my chest. Listening to this prayer is a balm to my busy spirit. Anxiety is a wave that sweeps many of us up in its path, scattering us like driftwood. It renders us ineffective, crippling us with self doubt. Reading over this passage again, I’m reminded of how many times God reminds us that fear is useless. What we need is trust in God’s plan for our lives. As I struggle with staying on the path God created for me, I took a peep at the calendar of the saints. 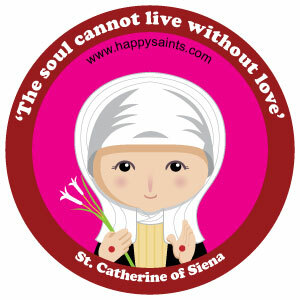 We just celebrated St Catherine of Siena’s feast day in late April. She’s the namesake for my youngest daughter, and one of her famous quotes emboldens me each time I see it. I’m also inspired by St Rose Venerini. Teacher? School Administrator? Yup – those are some of my titles, too. Encouraging women to unite and grow in our beautiful faith? That’s an area where I need some help, as I become the point person for the Mom’s Club at our parish. What about you? Do you struggle with anxiety, like me? Or are you setting the world on fire?